Chartres cathedral, seen in full from the south. 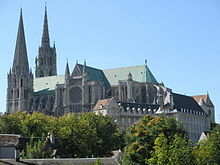 Chartres Cathedral (French: Notre-Dame de Chartres, Our Lady of Chartres) is a cathedral. It is in Chartres, about 80 km south of Paris. It is built in the Gothic style. Together with Amiens Cathedral and Reims Cathedral it is considered to be one of the finest examples of Gothic architecture (for churches) in France. A church was inaugurated at the spot by Charles the Bald in the year 864. The cathedral as it stands now was built from 1194 to 1260. It was made a basilica minor in 1908. In 1964 it was made an World Heritage Site by UNESCO. ↑ "Chartres Cathedral". UNESCO. Retrieved 8 May 2017. This page was last changed on 8 May 2017, at 15:58.